This property has a high hot water demand as the owner maintains a large marine fish tank. EnergyMyWay were asked to consider aesthetically pleasing solar panels to help reduce bills and generate earnings from government subsidies. 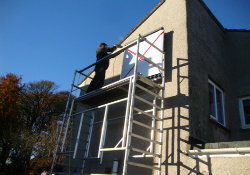 We recommended Viridian Solar Thermal plates which have the appearance of skylights and qualify for the government’s Renewable Heat Incentive. This young family approached EnergyMyWay looking for ways to reduce the running costs of their home, in particular their hot water usage.